In addition to your tracked keywords, Kompyte also detects keywords you are not currently tracking, for which many your competitors are running ads. 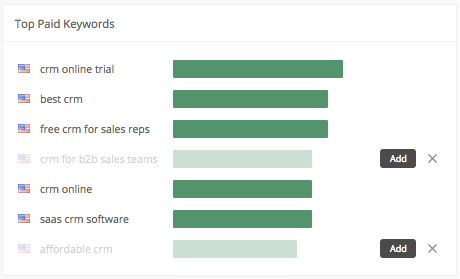 These keywords appear in the graph but are greyed out. You can add easily add these keywords to your account and begin tracking them by tapping the Add button to the right, or if you prefer to eliminate the keyword suggestion from your graph simply, tap the X button.